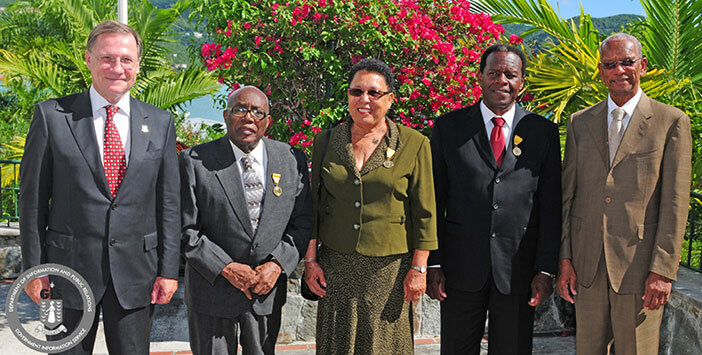 An investiture ceremony was held at Government House on 9 December to present BVI Badge of Honors to three community stalwarts, Mr. Clarence Cecil Thomas, Mr. Reynell Frazer, and Mrs. Marlene Penn-Trotman for their contribution to the Territory. The Badge of Honour is presented to a Virgin Islander, or a person who has been resident in the British Virgin Islands for more than 10 years, who has provided entrepreneurial goods and or services within the Territory for over 20 years; served as an outstanding public servant with a notable degree of integrity and a high standard of service; performed a life threatening act of bravery; given notable humanitarian service to others in the community for a significant number of years; given meritorious voluntary service in Non-Governmental Organizations, or exceptional business or professional service to the community; and has been instrumental in bringing about significant changes within the public service. This year’s honorees were awarded for various contributions. Mr. Thomas was awarded for his pioneer ventures in the business sector through Clarence Thomas Limited (CTL). He is one of the first trained plumbers in BVI, and has trained most of the plumbers in the BVI today. Mr. Frazer is the former Commissioner of the Royal Virgin Islands Police Force and was lauded for his contributions in that area. He was most regaled for his current voluntary services that include work in the various schools in the Territory and music ministry. Mrs. Penn-Trotman is the founder of the Family Support Network and served on various Committees over the years and she was praised highly for her noble endeavours. Premier Dr. the Hon. D. Orlando Smith in his remarks at the event said: “We honor the extraordinary work of three BV Islanders…The Badge of Honor is one of the highest accolades that can be awarded to a BV Islander. I was not surprised when I heard the names of this year’s recipients, all of whom I know well.” The Premier thanked the honourees for their hard work. 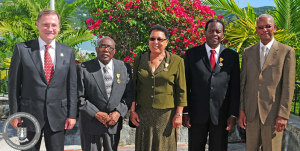 Mr. Charles Wheatley delivered a message on behalf of Antoinette Skelton, Chairperson of the BVI Honors Committee. He said: “I am happy to be part of this ceremony as we witness three stalwarts of our community receiving the Badge of Honor”.